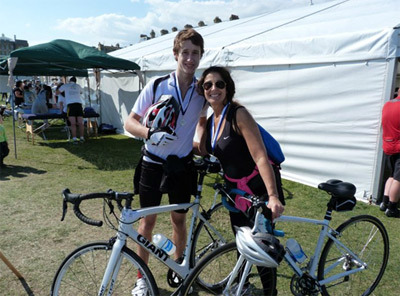 In July 2011, Natalie Jacobs, a long standing Aims2Cure committee member cycled the 60 mile London to Brighton bike ride with her son. She said “It took just over 6 hours of actual cycling through the beautiful and hilly British countryside. We suffered a broken chain and puncture but it didn’t deter us from the goal of crossing the finish line in Hove where family and friends awaited. We were absolutely exhausted but exhilarated and delighted to achieve our goal and raise funds for Aims2Cure. London – Paris next year. Who’s up for it?” After throwing herself out of a plane in 2010 in the name of charity, who knows what 2012 will bring! Thanks Nat as always for going the extra mile (literally! ).